say why? Some people say why not. its relevance to us as a Christian believer. This day is the founding day of the Church of Jesus / Yeshua (his Hebrew name). The Holy Spirit came in a mighty way just as Jesus had predicted it would. then would God choose this special day to inaugurate His Church? The bible they belong to God Himself. We have to be very careful to extradite ourselves from anti-Jewish bias that was unfortunately prevalent in the early Roman Church and early Church fathers.The truth is that God made this day as the day associated with final great harvest of the Jewish year. In a prophetic way it symbolizes the great final harvest of the world. And so it was that the world harvest of souls actually starts on this day! Remember it was Jesus Himself who told the disciples to wait in Jerusalem and not go out into the world to evangelize until they were endued with the Holy Spirit anointing that happened on the appointed day of Pentecost. We are not trying to earn some bonus points from God by celebrating this day, going back 1000s of years. Instead it is biblical. How can we celebrate this day? In our assembly we use the theme of Pentecost as the topic for the closest day of worship. 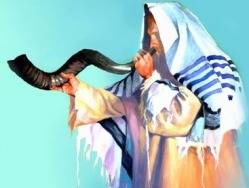 The theme is seen in the scriptures in the Tanach (Old Testament) like Lev 23 describing the 7 yearly feasts with feast of Weeks/Shavuot as the 4th feast and the New Testament scripture describing the fulfillment of this feast. Acts 1:4 where Jesus told the disciples to wait in Jerusalem. Acts 2:1 where the day of Pentecost outpouring starts the church age. to be revived, to take this opportunity to be renewed. Afterwards we have a special feast of food brought by the members for fellowship together. There is no legalism in this for us, just a blessing. But we are not judging of the recovering of good things from the Jewish roots of your faith.